Researchers of Human Media Lab at Queen's University, Kingston, Canada who developed the HoloFlex smartphone, used the game "Angry Birds" to demo their holographic phone screen. HoloFlex is made with a 3D screen and a flexible body that make images appear popping out at the user. 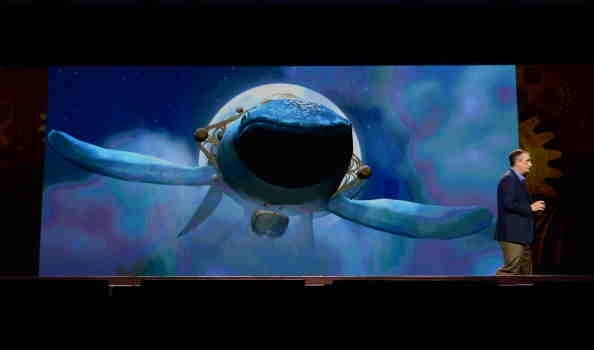 In a demo of the screen, the game has a cameo appearance for the new technology which makes use of stereoscopy and motion parallax to render 3D images sans the glasses. The phone's screen does not use the "create two images" traditional way of building 3D screens, but utilizes over 16,000 fisheye lenses which scatter the light from the screen in many directions. The tech is built into a Flexible Organic Light Emitting Diode and bendable touchscreen. It uses a bendy smartphone's oft-stated upsides with a built-in bend sensor that makes use of motion as a way to interact with the handset. The lenses render a bit different view of the object on the display. The image appears 3D to those who are near, and eliminates the need of 3D glasses or some head-tracking systems. "HoloFlex offers a completely new way of interacting with your smartphone," HML Director Dr. Roel Vertegaal said in a press release posted on the lab's blog that announced the new technology. Vertegaal is a Human-Computer Interaction at the School of Computing in Queen's University. "It allows for glasses-free interactions with 3D video and images in a way that does not encumber the user," he added. The demo video that shows the technology has a pair of hands that use the motion to move objects along the Z-axis of the smartphone. In the Angry Birds game, the bird-catapulting slingshot is being stretched where the tension on the handset correlates with the elastic band as it stretches back, TechCrunch reported. The tech has a low resolution screen, at 160 x 104, which is needed to divide the full high density display to achieve the 3D effect. Internal specs include a Qualcomm Snapdragon 810 1.5GHz chip, Adreno 430 GPU, 2GB RAM and Android 5.1. It is still in its early stage, but the lab has great plans, such as holographic video conferences. The tech will be on display at ACM CHI 2016, San Jose, California this week. How Magic Leap is suddenly emerging as Microsoft HoloLens contender? Is Kinetic’s unpleasant experience withholding Microsoft from launching HoloLens?